In a society where emotions are nothing, Avlyn Lark is just trying to blend in. So when she starts seeing strange visions, Avlyn fears she’ll be exposed for what she really is. And if anyone finds out about her secret meetings with a mysterious but handsome member of the rebel forces, her life will be more than ruined. It will be over. $0.99 on Kindle. 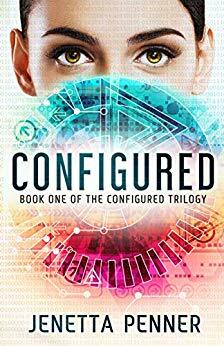 Visit gagaoverbooks.com daily and download more books like "Configured" by Jenetta Penner. We're dedicated to bookaholics, and each day we feature new free and discounted Kindle ebooks in the Science Fiction & Fantasy genre as well as other categories of fiction and non-fiction. Disclaimer: The price of Configured was accurate when this post was published on March 19th, 2019. However, Amazon can and does change Kindle book prices frequently and without notice. Always look closely at the price of an ebook on Amazon before clicking that yellow button. If you purchased a Kindle book by accident, it's simple to return, just follow the return instructions here. Previous Previous post: Free: Add THIS to Your Plate!